…Geno became a women’s coach by accident. He was 21, without a job. A friend asked him to help out coaching a girls’ high school team. Geno said, “Girls! No way.” Then he thought about it. “I realized it could be pretty cool,” he tells me. “So I gave it a shot. The girls listened to me. They appreciated what I taught them.” His high school job led to an assistant coaching job on the University of Virginia’s women’s team, which led, in 1985, to an interview for the head job at UConn. By then, Geno had decided that he “liked coaching women. But I didn’t view it as coaching women. I was just coaching the game the way it should be played. "I’m a gender-neutral coach" -- I love that line. I'm all for women's rights and equality, but sometimes I think people take things too far. The other coach is insulting the intelligence of these young women by calling it "person-to-person defense". They know how everyone refers to "man-to-man" defense. Yeah, let's be different so we can get ridiculed. Do they go into the woperson bathroom? One of the qualities Geno respects about his girls is that they realize "there are a lot of things on the court they'd love to do, but they aren't physically able." So they circumvent their physical limitations. "Women are naturally pleasers," he says, "Which makes them more open to listen and do things not from their background. They try to do what you want them to do (even if it's foreign to them)." 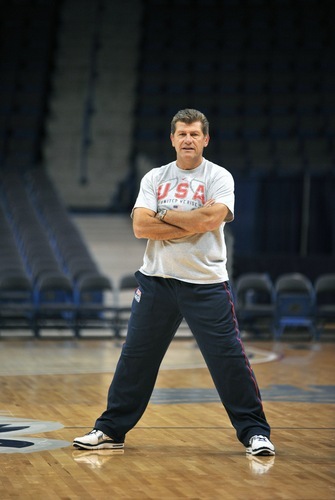 Geno respects that in a way he doesn't respect the attitudes of the men who play big-time basketball. "With men," he says, "you constantly have to battle to keep them focused on what's important, winning, being a good teammate, versus individual temptations, going to another level. Women naturally take to playing together as an ensemble. They help each other as teammates to get open, with a screen, a cut to the hoop, a bounce pass. Listen, guys think they're doing you a favor going to your place. The girls come here to go to college, to study their asses off, and get to play basketball. We get to keep them four years and watch them grow." I didn't know what Pat would make of Geno when he went to do this story but he liked him a lot. Two old-school Italian guys. Glad the story found a home. I believe it's the Woperdaughter's bathroom. OT, Yanks Sawx on the 4 letter network, probably the NESN feed, but Remy & the other guy are pretty good. Of course this headline made me think of Pat Summitt and Geno, not Pat Jordan. There are 2 Philly cheesesteak places across the way from each other named Pat and Geno's too. The two best teams in women's college basketball are linked like the Yankees and Red Sox.